I recently joined SAS in a brand new role: I'm a Developer Advocate. My job is to help SAS customers who want to access the power of SAS from within other applications, or who might want to build their own applications that leverage SAS analytics. For my first contribution, I decided to write an article about a quick task that would interest developers and that isn't already heavily documented. 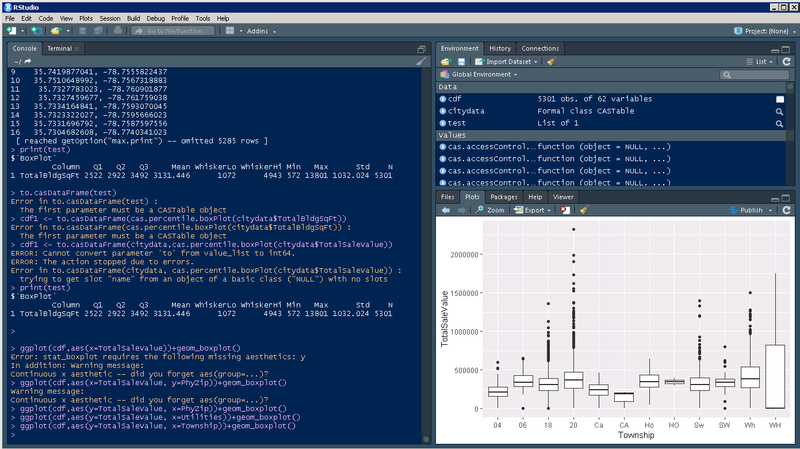 So was born this novice's experience in using R (and RStudio) with SAS Viya. This writing will chronicle my journey from the planning stages, all the way to running commands from RStudio on the data stored in SAS Viya. This is just the beginning; we will discuss at the end where I should go next. Why use SAS Viya with R? From the start, I asked myself, "What's the use case here? Why would anyone want to do this?" After a bit of research discussion with my SAS colleagues, the answer became clear. R is a popular programming language used by data scientists, developers, and analysts – even within organizations that also use SAS. However, R has some well-known limitations when working with big data, and our SAS customers are often challenged to combine the work of a diverse set of tools into a well-governed analytics lifecycle. Combining the developers' familiarity of R programming with the power and flexibility of SAS Viya for data storage, analytical processing, and governance, this seemed like a perfect exercise. For this purpose of this scenario, think of SAS Viya as the platform and the Cloud Analytics Server (CAS) is where all the data is stored and processed. I did not want to start with the task of deploying my own SAS Viya environment. This is a non-trivial activity, and not something an analyst would tackle, so the major pre-req here is you'll need access to an existing SAS Viya setup. Fortunately for me, here at SAS we have preconfigured SAS Viya environments available on a private cloud that we can use for demos and testing. So, SAS Viya is my server-side environment. Beyond that, a client is all I needed. I used a generic Windows machine and got busy loading some software. What documentation did I use/follow? I started with the official SAS documentation: SAS Scripting Wrapper for Analytics Transfer (SWAT) for R.
After installing the dplyr package in the R session, I reran the swat install and was happy to hit a return code of zero. Success! For the brevity of this post, I decided to not configure an authentication file and will be required to pass user credentials when making connections. I will configure authinfo in a follow-up post. Now that I succeeded in connecting my R client to the CAS server, I was ready to load data and start making API calls. How did I decide on a use case? I'm in the process of moving houses, so I decided to find a data set on property values in the area to do some basic analysis, to see if I was getting a good deal. I did a quick google search and downloaded a .csv from a local government site. At this point, I was all set up, connected, and had data. All I needed now was to run some CAS Actions from RStudio. NOTE: Cloud Analytic Services made the uploaded file available as table PROPERTY in caslib CASUSER(user). What analysis did I perform? I purposefully kept my analysis brief, as I just wanted to make sure that I could connect, run a few commands, and get results back. I think so. Let's say the house I want is 3,000 square feet and costs $258,000. As you can see in the box plot data, I'm getting a good deal. The house size is in the second quartile, while the house cost falls in the first quartile. Yes, this is not the most in depth statistical analysis, but I'll get more into that in a future article. This activity has really sparked my interest to learn more and I will continue to expand my analysis, attempt more complex statistical procedures and create graphs. A follow up blog is already in the works. If this article has piqued your interest in the subject, I'd like to ask you: What would you like to see next? Please comment and I will turn my focus to those topics for a future post. Using RStudio with SAS Viya was published on SAS Users. Good news learners! SAS University Edition has gone back to school and learned some new tricks. With the December 2017 update, SAS University Edition now includes the SASPy package, available in its Jupyter Notebook interface. If you're keeping track, you know that SAS University Edition has long had support for Jupyter Notebook. With that, you can write and run SAS programs in a notebook-style environment. But until now, you could not use that Jupyter Notebook to run Python programs. With the latest update, you can -- and you can use the SASPy library to drive SAS features like a Python coder. Oh, and there's another new trick that you'll find in this version: you can now use SAS (and Python) to access data from HTTPS websites -- that is, sites that use SSL encryption. Previous releases of SAS University Edition did not include the components that are needed to support these encrypted connections. That's going to make downloading web data much easier, not to mention using REST APIs. I'll show one HTTPS-enabled example in this post. When you first access SAS University Edition in your web browser, you'll see a colorful "Welcome" window. 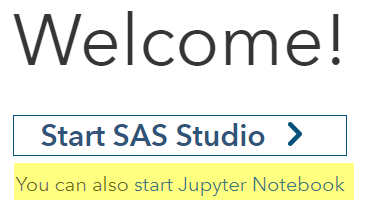 From here, you can (A) start SAS Studio or (B) start Jupyter Notebook. For this article, I'll assume that you select choice (B). However, if you want to learn to use SAS and all of its capabilities, SAS Studio remains the best method for doing that in SAS University Edition. When you start the notebook interface, you're brought into the Jupyter Home page. To get started with Python, select New->Python 3 from the menu on the right. You'll get a new empty Untitled notebook. I'm going to assume that you know how to work with the notebook interface and that you want to use those skills in a new way...with SAS. That is why you're reading this, right? Here's the result. This is all straight Python stuff; we haven't started using any SAS yet. SASPy includes a collection of built-in objects and methods that provide APIs to the most commonly used SAS procedures. The APIs present a simple "Python-ic" style approach to the work you're trying to accomplish. 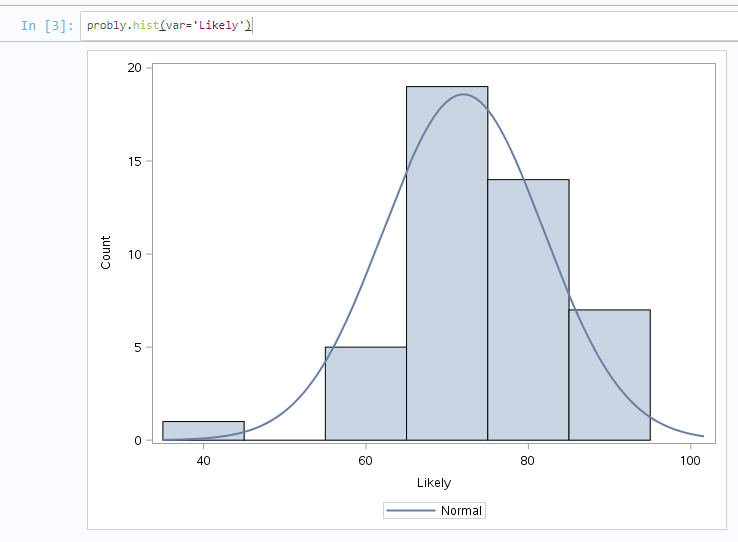 For example, to create a SAS-based histogram for a variable in a data set, simply use the hist() method. In SASPy, all methods generate SAS program code behind the scenes. If you like the results you see and want to learn the SAS code that was used, you can flip on the "teach me SAS" mode in SASPy. Interesting code, right? Does it make you want to learn more about SCALE= option on PROC SGPLOT? If you want to experiment with SAS statements that you've learned, you don't need to leave the current notebook and start over. 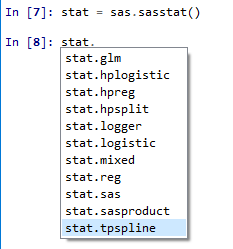 There's also a built-in %%SAS "magic command" that you can use to try out a few of these SAS statements. SAS University Edition includes over 300 Python modules to support your work in Jupyter Notebook. To see a complete list, run the help('modules') command from within a Python notebook. This list includes the common Python packages required to work with data, such as pandas and NumPy. However, it does not include any of the popular Python-based machine learning modules, nor any modules to support data visualization. Of course, SASPy has support for most of this within its APIs, so why would you need anything else...right? Because SAS University Edition is packaged in a virtual machine that you cannot alter, you don't have the option of installing additional Python modules. You also don't have access to the Jupyter terminal, which would allow you to control the system from a shell-like interface. All of this is possible (and encouraged) when you have your own SAS installation with your own instance of SASPy. It's all waiting for you when you've outgrown the learning environment of SAS University Edition and you're ready to apply your SAS skills and tech to your official work! How to code in Python with SAS 9.4 - Chevell Parker (SAS Tech Support Rock Star) shares the basic "How to" for getting started with SASPy. Introducing SASPy: Using Python code to access SAS - Includes a video demo from Jared Dean (SASPy developer) that shows off some of the cool capabilities in SASPy. The post Coding in Python with SAS University Edition appeared first on The SAS Dummy. The SAS® platform is now open to be accessed from open-source clients such as Python, Lua, Java, the R language, and REST APIs to leverage the capabilities of SAS® Viya® products and solutions. You can analyze your data in a cloud-enabled environment that handles large amounts of data in a variety of different formats. To find out more about SAS Viya, see the “SAS Viya: What's in it for me? The user.” article. Note: SASPy is an open-source project that encourages your contributions. Note: I used Jupyter Notebook to run the examples in this blog post. To view the attributes of this SASdata object named tabl, use the PRINT() function below, which shows the libref and the SAS data set name. It shows the results as Pandas, which is the default result output for tables. 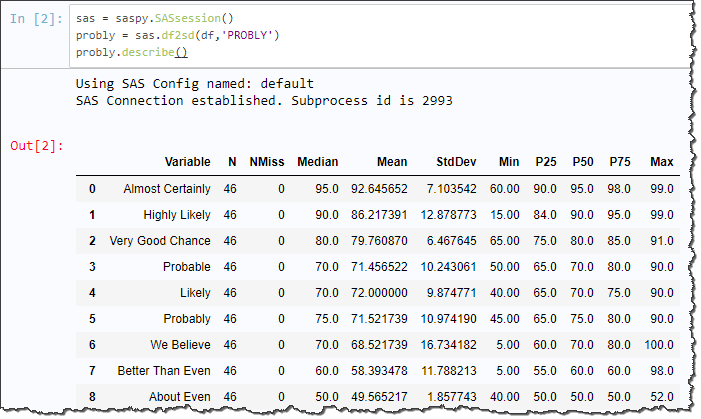 This section provides some examples of how to use different methods to interact with SAS data via SASPy. After verifying that the data is what you expected, you can now analyze the data. To generate a simple summary of the data, use the Python describe() method in conjunction with the index [1:3]. This combination generates a summary of all the numeric fields within the table and displays only the second and third records. The subscript works only when the result is set to Pandas and does not work if set to HTML or Text, which are also valid options. Then, use the submit() method to execute the PROC CONTENTS that are displayed in the cell above directly from Python. The submit method returns a dictionary with two keys, LST and LOG. The LST key contains the results and the LOG key returns the SAS log. The results are displayed as HTML. The HTML package is imported to display the results. 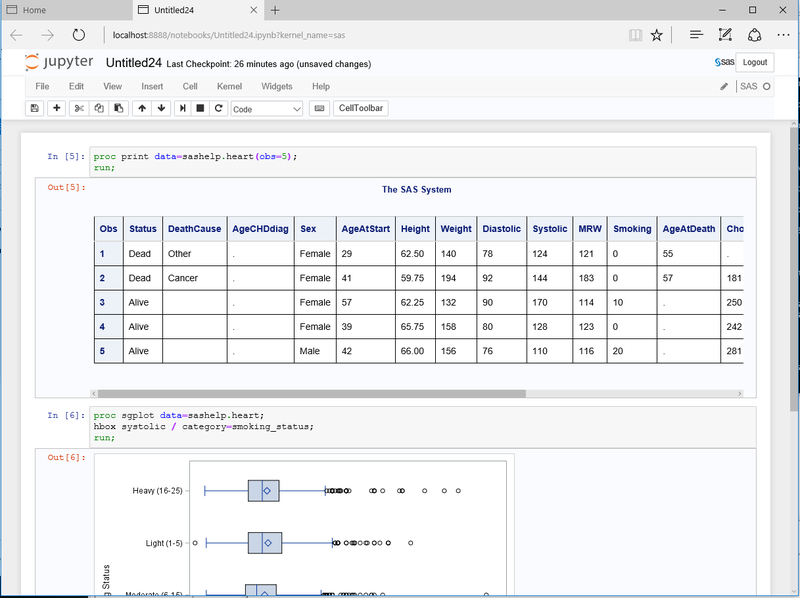 You can add SAS code to a cell in Jupyter Notebook and execute it. The following code adds a PRINT procedure and a SGPLOT procedure. The output is in HTML5 by default. However, you can specify a different output format if needed. You can also use magics in the cell such as the %%python magic even though you are using the SAS kernel. You can do this for any kernel that you have installed. There are more ways of interacting with other languages with SAS as well. For example, you can use the Groovy procedure to run Groovy statements on the Java Virtual Machine (JVM). You can also use the LUA procedure to run LUA code from SAS along with the ability to call most SAS functions from Lua. For more information, see “Using Lua within your SAS programs.” Another very powerful feature is the DATA step JavaObject, which provides the ability to instantiate Java classes and access fields and methods. The DATA step JavaObject has been available since SAS® 9.2. Come on in, we're open: The openness of SAS® 9.4 was published on SAS Users. One of the big benefits of the SAS Viya platform is how approachable it is for programmers of other languages. You don't have to learn SAS in order to become productive quickly. We've seen a lot of interest from people who code in Python, maybe because that language has become known for its application in machine learning. SAS has a new product called SAS Visual Data Mining and Machine Learning. And these days, you can't offer such a product without also offering something special to those Python enthusiasts. And so, SAS has published the Python SWAT project (where "SWAT" stands for the SAS scripting wapper for analytical transfer. The project is a Python code library that SAS released using an open source model. That means that you can download it for free, make changes locally, and even contribute those changes back to the community (as some developers have already done!). 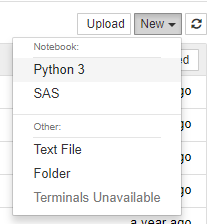 You'll find it at github.com/sassoftware/python-swat. Kevin enjoys the dynamic, fluid style that a scripting language like Python affords - versus the more formal "code-compile-build-execute" model of a compiled language. Watch this video (about 14 minutes) in which Kevin talks about what he likes in Python, and shows off how Python SWAT can drive SAS' machine learning capabilities. 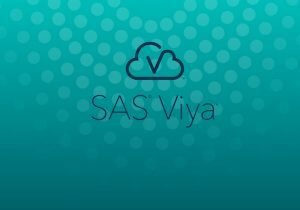 The analytics engine behind the SAS Viya platform is called CAS, or SAS Cloud Analytic Services. You'll want to learn that term, because "CAS" is used throughout the SAS documentation and APIs. And while CAS might be new to you, the Python approach to CAS should feel very familiar for users of Python libraries, especially users of pandas, the Python Data Analysis Library. 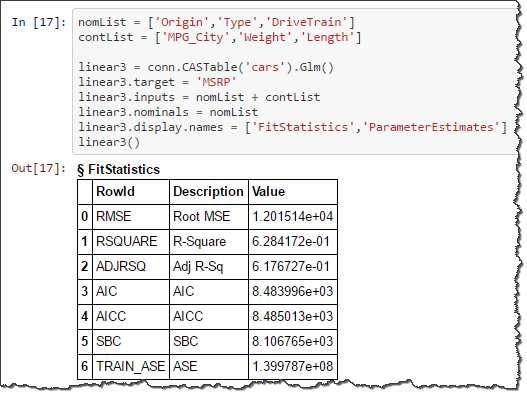 How to coax CAS to provide descriptive statistics about your data, and then go beyond what's built into the traditional DataFrame methods. Kevin wrote a book (with coauthor Xiangxiang "X2" Meng) about this topic: SAS Viya: The Python Perspective. The authors also shared the sample code from the book on GitHub. Check out the many sample Python notebooks (including one specifically for people who are new to Python). Kevin and others have also been populating the sas-viya-programming project on GitHub. You'll find Python code samples, plus examples for accessing SAS Viya from other languages including SAS and R.
SAS trainers have recorded a tight 5-minute tutorial, "Getting Started with the Python Interface of SAS Viya". Be sure to check that out for a great overview of connecting to CAS and using several of the available actions. And don't forget to check out the SAS Support Communities for SAS Viya coders. You can post questions and connect with the experts from SAS (and the rest of the world). And finally, what if you don't have SAS Viya yet, but you're interested in using Python with SAS 9.4? Check out the SASPy project, which allows you to access your traditional SAS features from a Jupyter notebook or Python console. It's another popular open source project from SAS R&D. The post Using Python to work with SAS Viya and CAS appeared first on The SAS Dummy. Thanks to a new open source project from SAS, Python coders can now bring the power of SAS into their Python scripts. The project is SASPy, and it's available on the SAS Software GitHub. It works with SAS 9.4 and higher, and requires Python 3.x. I spoke with Jared Dean about the SASPy project. Jared is a Principal Data Scientist at SAS and one of the lead developers on SASPy and a related project called Pipefitter. Here's a video of our conversation, which includes an interactive demo. Jared is obviously pretty excited about the whole thing. SASPy brings a "Python-ic" sensibility to this approach for using SAS. That means that all of your access to SAS data and methods are surfaced using objects and syntax that are familiar to Python users. This includes the ability to exchange data via pandas, the ubiquitous Python data analysis framework. And even the native SAS objects are accessed in a very "pandas-like" way. 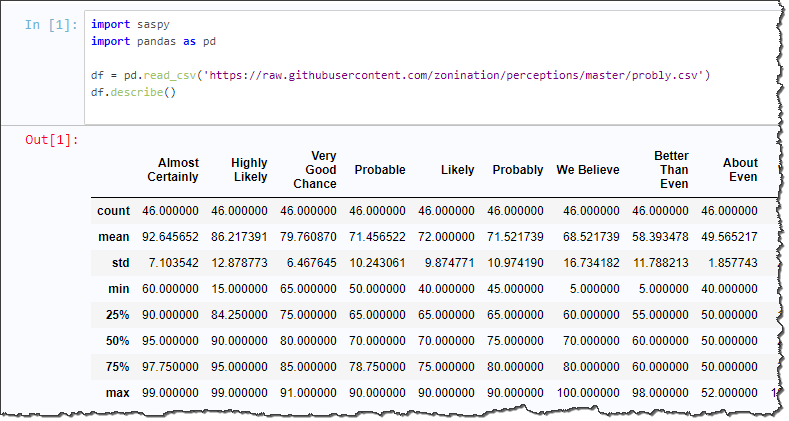 The output is what you expect from pandas...but with statistics that SAS users are accustomed to. PROC MEANS anyone? The SAS Pipefitter project extends the SASPy project by providing access to advanced analytics and machine learning algorithms. In our video interview, Jared presents a cool example of a decision tree applied to the passenger survival factors on the Titanic. It's powered by PROC HPSPLIT behind the scenes, but Python users don't need to know all of that "inside baseball." The jar files are compatible between Windows and Unix, so if you find them in a Unix SAS install you can still copy them to your Python Windows client. You'll need to modify the sascgf.py file (installed with the SASPy package) to point to where you've stashed these. If using local SAS on Windows, you also need to make sure that the sspiauth.dll is in your Windows system PATH. The easiest method to add SASHOMESASFoundation9.4coresasexe to your system PATH variable. All of this is documented in the "Installation and Configuration" section of the project documentation. The connectivity options support an impressively diverse set of SAS configs: Windows, Unix, SAS Grid Computing, and even SAS on the mainframe! SASPy is an open source project, and all of the Python code is available for your inspection and improvement. The developers at SAS welcome you to give it a try and enter issues when you see something that needs to be improved. And if you're a hotshot Python coder, feel free to fork the project and issue a pull request with your suggested changes! The post Introducing SASPy: Use Python code to access SAS appeared first on The SAS Dummy.